For lovers of the most classic guitar models ever made, Raymond Weil has collaborated with Gibson for this sonically induced piece, with a dial inspired by the fretboard and subdials that feature a screw bolt to reinforce the feeling of an instrument. 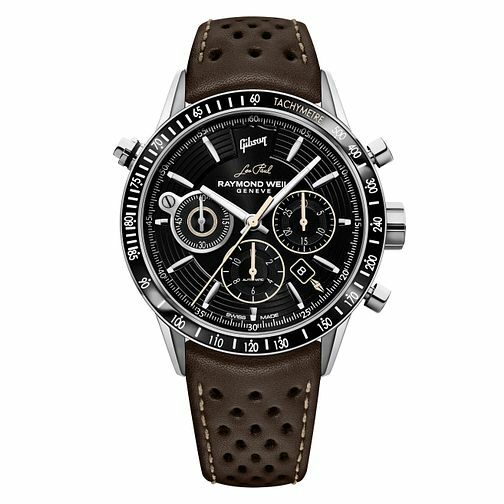 The iconic Gibson logo is included on the dial and a tachymeter surrounds the bezel to help track with speed. With three additional buttons on the case, you can track time separately and effortlessly on the subdials; a requirement for any musician. The piece is finished by a brown leather strap punctuated by holes that resemble the feeling of a guitar strap for an authentically musical piece.